Former Wildcat, Gordon Brown, passed his number “44” football jersey down to David Ghiloni, anticipating a great season from the 2016 senior defensive back and wide receiver. 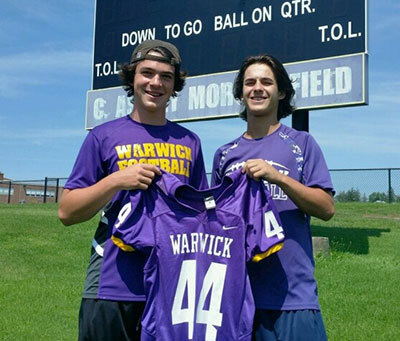 Behind Ghiloni and the team’s seniors, Warwick football has won three games in a row, and will head into the Section 9 AA Football Tournament this weekend as the #5 seed, taking on Monroe-Woodbury (#4 Seed) in Central Valley. Kick–off is slated for 7:00 p.m. on Fri., Oct. 21. David is one of three brothers to excel as athletes in the Purple and Gold. Joe recently graduated from the University of New Hampshire and Nick is a sophomore in college.